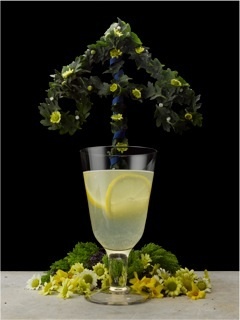 This Friday Kanon Organic Vodka is hosting a little "Midsummer" event at the Soho Grand Hotel in New York City. I wish I was able to jump on a plane to join in on the festivities but for now I'll have to sip this delicious cocktail from the left coast. Add ingredients to the cocktail shaker. Shake and strain into martini glass. Garnish with lemon twist and enjoy.